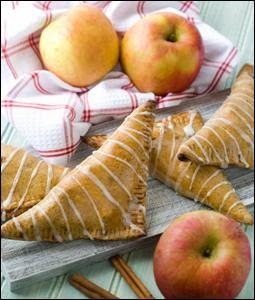 Not only is harvest season for apples upon us, but October happens to be National Apple Month.Apple Turnovers – the perfect snack to prepare in celebration of Fall. WearEver’s Apple Turnover recipe is easy and quick to prepare, and is sure to be a favorite among your family and friends. These delicious Apple Turnovers are perfect for baking after your next apple picking trip. They will spice up your kitchen this fall and leave your home smelling wonderful while you feel healthy and happy. Remember that using the proper bakeware is essential to making recipes perfect! The NEW WearEver Pure Living Bakeware collection features ceramic coated surfaces, which are free of PFOA, PTFE, and cadmium - a safe, eco-friendly alternative to nonstick. Durable and easy-to-use, the bakeware is dishwasher safe, scratch resistant, stain resistant and high temperature resistant, as well as suitable for use with metal utensils.